Walking into The RiverGarden is like stepping into your own adventure. 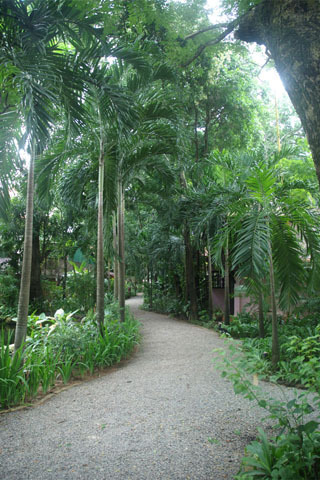 The path winding through the tall jungle gardens leads to a group of chalets housing medium sized rooms, all with air-con and most of the amenities, including TV, minibar (some rooms only) and tea/coffee-making facilities. The rooms are quaint, comfortable and stylish, and clearly the owner has been rummaging as each has its own unique piece of antique furnishing of Khmer or Chinese origin. During the rainy season, some of the ground floor chalets may have a touch of damp, but they are otherwise very pretty, and from each one you step out every morning into a jungle oasis. The deluxe balcony rooms are our favourites, each for different reasons. The one above the restaurant is particularly lovely, and the most modern of all the rooms, with a gorgeous vaulted ceiling and lots of space. The hotel restaurant has a good reputation, and they also pride themselves on their bakery goods, such as brownies, muffins and banana cake. Breakfast is a delicious buffet including house-made breads, jams and muesli. The hotel organises its own cookery classes which are very popular, as well as street food tours to gently, and safely, guide you through the vagaries of the local cuisine and customs. The sense of fun and creativity of the owner is evident everywhere, from the quirky little heart-warming slogans on the walls to teapots posing as plant pots. They offer good, curated tour information. The prices below will likely be negotiable during low season. They include breakfast. Check rates at The River Garden on Booking.com.